In the last Back in Time we told readers about Steve Hachenberger of Montana who bought and donated the original 1936 Number 25 license plates that belonged to Charles Henry Davis in his Good Roads Everywhere campaign. For his donation, the State of Montana reproduced the license plates for him. Here is the continuation of this event. 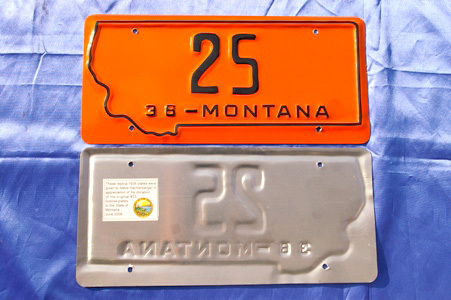 Montana Compliance Specialists Brent Sells and the license Plate Plant in Deer Lodge Montana, created a new replica set of No. 25 "Good Roads Plates." It has taken several months of hard work on behalf of many people to re-create the famous Number 25 license plates known as "Good Roads Plates." I purchased the original plates from a seller on the internet in New York. The matching 1936 Montana No. 25 plates were made in 1936 for Charles Henry Davis and his "Good Roads Everywhere" campaign across the United States and the National Highways Association. His antique car carried No. 25 plates from all 48 States and U.S. Territories. I purchased the plates to license my 1936 Chevrolet and intended to have the originals approved for daily use on my car. After review, it became apparent that this set of plates was a part of Montana's history and infrastructure. It would be a waste to have them "stolen" off the car and lost forever. With the help of Montana Compliance Specialists Brent Sells and the license Plate Plant in Deer Lodge Montana, a new "Replica Set" of No. 25 plates were made. Not all the parts were available to press the new plates. The rear storage yard was searched for the old stamping presses from the era. The result was not good. The needed stamping dies were most likely sold as scrap for the War Effort during WWII. Not to be discouraged, the workers at the plant began making the missing parts from hardwood to make their own dies. Along with some trial and error they were able to make a new set in the same dimensions and color as the originals of 1936. The new set also contains a "thank you" from the State of Montana on the reverse. It is important to note that the State of Montana does NOT make "replica plates" as a rule. The State will make personal plates and its usual "Historical Vehicle & Antique" plates for people that want them. It was due to the unique nature of the donation that led to the making of the replica plates. It is unclear where the plates will be displayed . . . but one thing is certain: they are now in safe hands and back home in Montana after thousands of miles and 72 years of trail dust.